Nothing says Christmas like a murder-for-hire. 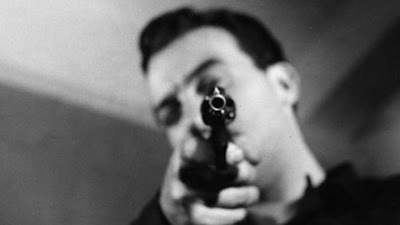 Blast of Silence is a 1961 noir film written, directed, and starring Allen Baron. 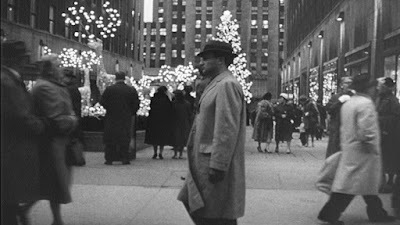 There are a few things that set the movie apart from other noir films, but the most obvious one is that the setting is New York City during the week of Christmas. 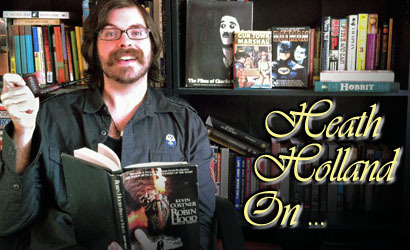 Therefore, every dark deed and double cross is set against the backdrop of Christmas lights and holiday cheer. 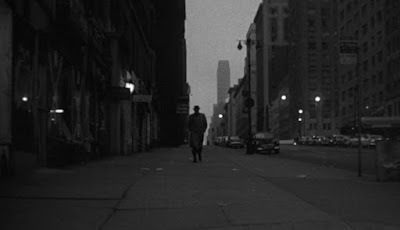 Also, because this film comes a little after the accepted “heyday” of noir (most of the people who study things like this agree that the cycle ended in 1958 with A Touch of Evil), the aesthetic is just a little different than what we’re used to seeing in a hardboiled crime noir. Frank Bono is a contract killer who has arrived in New York from Cleveland to rub somebody out. The film plays out almost in documentary style, with us following Frank through his dirty deeds. He stalks his prey and learns his patterns, but along the way he meets someone he grew up with in an orphanage years ago and gets sidetracked when he sees the direction his life could have taken. The film might as well be subtitled “A Day in the Life of a Hitman” because that’s essentially what it depicts. 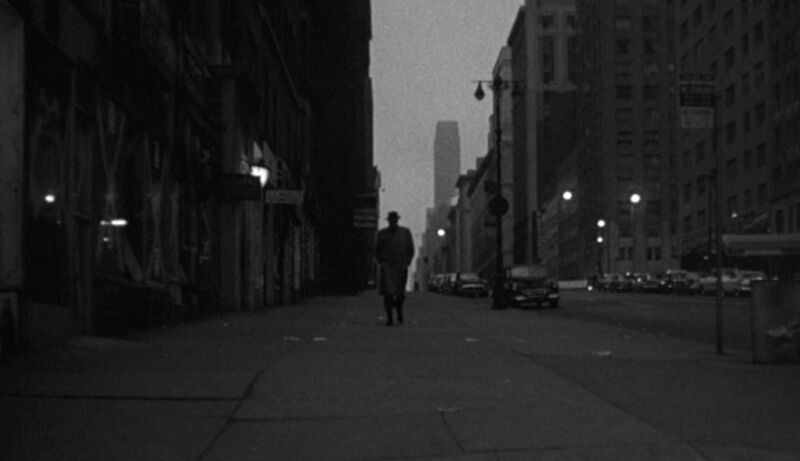 Shot in a gritty, realistic style that owes much to shows like Dragnet--or better yet, The Naked City, Blast of Silence isn’t afraid to show the seedy underbelly of the criminal world. Through it all, there’s a constant narration which may or may not be Frank’s conscience, or perhaps his lack thereof. It’s through this narration that we learn who Frank really is underneath it all, and how empty of humanity he actually is. Because this is a post-noir film, it draws heavily on all the tropes that had, by 1961, become pretty routine, perhaps even cliché. The movie begins with a train in a long, dark tunnel, the end seemingly miles away. The narration (penned apart from the screenplay by Mel Davenport, pen name for Waldo Salt) immediately bombards us with birth metaphors and discussion of how we’re met with a slap as soon as we arrive in the world. This narration is just oozing with envy for Dashiell Hamett, and we get lines like “When people look at you, baby boy Frankie Bono, they see death…death across the counter.” This is a movie that is in love with the noir style and wears its influences on its sleeve; it dresses up like the thing it wants to be. The strange thing is, it pulls it off, and was close enough to its influences to infiltrate their ranks and become one of them. Because the film was made in 1961, there’s a jazzy, beatnik undercurrent that permeates the whole production. The guys wear fedoras and trench coats, but the music of bongos is in the air. It’s more Mad Men than Out of the Past, and style is definitely a key component in this movie’s success. The sixties had arrived and everything was starting to take on that futuristic look; the cars are angular and sleek, and there’s revolution under the surface. Maybe that’s why the movie seems to be completely comfortable taking on Christmas as a commercial holiday with no substance. “You hate Christmas so much, you can’t stand the thought of sweating it out alone in some crummy hotel room,” the narrator tells Frank as he wanders Rockefeller Center, the gigantic Christmas tree looming threateningly in the background. A distant choir sings carols that have never sounded so ominous. The choice to film in stark (but beautiful) black and white in a time when color was becoming the norm also adds to the bleakness. Blast of Silence is populated by some really slimy characters that you don’t find in other movies from this time. There’s violence, too, far more graphic than anything you’d be prepared to see in a movie that’s from this era [Editor's note: Era.] of cinema. Everything about his film is unsettling, as if to hammer a nail in the coffin of the post-war idealism and the subsequent prosperity of the Nifty Fifties. This is an angry movie, one that allows no possibility of redemption. It sees Christmas as empty commercialism, the people of New York as mindless drones, and the world as an unforgiving place. Frank is a loner, only comfortable to be completely by himself and in control of his own destiny. In many ways, Blast of Silence reminds me of Taxi Driver. I suspect that it has to be some sort of a prototype for what Scorsese would later accomplish with his movie, as both films delve deep into the psyche of a damaged human being and unpack what makes them tick. The themes somehow seem just as fresh and relevant now as they did in 1961 (perhaps even more so), and I appreciate that the film succeeds at getting inside a character’s head and showing such unrelenting darkness. It’s so rare for a movie from the classic era to allow itself to be so bleak without at least a hint at light. But this was an independent production, apparently shot in the guerilla style, and it’s anything but conventional. Any shortcomings in Allen Baron’s performance are more than made up for by his story and his efficient direction. The movie is available on DVD from Criterion (Shiny! Fancy!) and works perfectly at this time of the year as counterprogramming to the usual Christmas fare. When you’re sick of hearing the same holiday songs on the radio and seeing the same TV specials over and over, here’s a movie that allows you to wallow in the dirt for 77 minutes. If It’s a Wonderful Life is a warm and affirming statement on how important we each are, Blast of Silence says that it’s all hollow and meaningless and that we’re all just cattle marching to the slaughter. The reality presented in the film is not a place I’d want to live in, but it’s nice to visit every once and a while. Especially when things start to feel just a little too commercial. I recommend this movie for those occasions, or to study how it shows the mind of a killer in creative and unique ways. When subject matter such as this is presented in a package this stylish and cool, I can’t help myself. Merry Christmas and happy holidays, ya mugs. Watched this one last week. It was a nice change of pace. Definitely an interesting time period for noir, like you said. It kind of felt like a mashup, but in just the sort of way that works. I'm glad that it exists, and Allen Baron's mean voiceover will always be a tiny piece of my concept of Christmas from now on.